The other weekend I rode my longest ever bike ride – The Arqi loop which is a massive 160km all in. I was super nervous about this ride – 160km is a serious distance and coupled with the heat factor I knew I would need to properly prepare. When you are cycling, your body is a furnace for carbohydrates, burning through them from start to finish - and afterwards. Most people have enough carbs stored in their muscles to ride for around 90 minutes before they start to run out, and this results in lethargy and reduced performance if you don’t keep topping up! I knew this ride would ake a minimum of 5 and a half hours, so I would need plenty of extra fuel! I made some little peanut butter and jam sandwich squares made from Arabic bread and wrapped them individually in tin foil – not bulky and easy to pull out the back jersey pocket and unwrap on the move. I also had a couple of energy gels which are a great way of getting the energy in quickly – plus they come in easy to carry pouches, and most are consumed by simply ripping off the top, and squeezing the gel into your mouth – easy peasy on a bike. On every long ride, regular water stops are essential, so care must be taken to check the route in advance for gas stations, small coffee shops, or any place with an outside drinking water tap. Seriously, you don’t want to run out of water on a long ride – dehydration is a dangerous business!! The ride started in Shatti, and took us down through Amerat, onto the highway towards Quriyat before turning off at Massarah, and riding a loop down past Wadi Serin, and through the village of Arqi before re-joining the main road at Sawaqim and heading back. The route itself isn’t too difficult with just 800mof climbing in total and most of it through rolling rugged landscape with some breath taking views. It has to be said, when you’re pedalling along an open road off the beaten track, it’s a whole body experience which allows you to not only see but feel the landscape. You are able to appreciate so much more than if you were just driving your car looking out the windows. It can be quite humbling!! 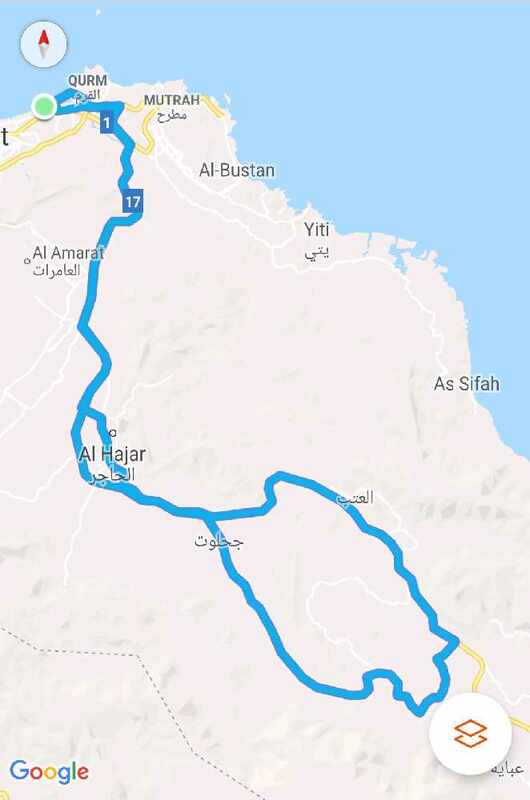 The Arqi Loop ride took 5hrs 51 minutes in total and it’s safe to say that the last 30km from Amerat town back to Costa in Shatti in 42 degree heat at mid-day was pretty challenging! Overall though, what a great experience! !